Ousted Honduran President Jose Manuel Zelaya said Wednesday he will not return to his home country until at least Saturday, after a three-day international deadline to reinstate him. 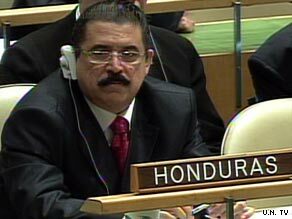 Zelaya had said earlier he would return to Honduras on Thursday. Provisional Honduran President Roberto Micheletti said Tuesday that Zelaya would be arrested on multiple charges if he returns. The Organization of American States passed a resolution early Wednesday saying that Zelaya should be returned to power within 72 hours. The United Nations unanimously passed a similar resolution Tuesday afternoon. The governments of most Latin American nations, as well as the United States and Canada, have voiced their displeasure with the coup and said they want Zelaya back in power. The World Bank said Tuesday it would freeze funds to Honduras until the crisis is resolved, and the United States said it is reviewing its aid to the Central American nation. In addition, several Latin American countries said they would withdraw their diplomats from Honduras. The Honduran military detained Zelaya early Sunday morning and flew him to Costa Rica. Micheletti, the president of Congress, was sworn in that afternoon. Watch interview with Micheletti (in Spanish) » Zelaya, a leftist who took office in 2006, had been at odds with Congress, the Supreme Court and the military over a referendum he planned to hold Sunday. Congress had forbidden it and the Supreme Court ruled it illegal. Military officers began discussing whether Zelaya’s proposed referendum was legal more than two months before he was removed from office, a top army official said Tuesday. The army’s chief legal officer, Col. Herberth Bayardo Inestroza, sought a legal opinion from the nation’s top general on April 27, Inestroza told CNN en Español’s Krupskaia Alis. Gen. Romeo Vasquez Velasquez decided the referendum would be illegal and informed Zelaya that the armed forces would not participate. Velasquez fired him last week. The Supreme Court ordered the general reinstated. The president ignored those actions and vowed to hold the vote Sunday anyway. He was toppled before the voting started. Some observers say Zelaya would be well-served to wait for a deal to be brokered before he returns to Honduras. “My sense is that president Zelaya’s idea of returning to Honduras immediately is probably a bad idea and it is likely to make a bad situation worse,” said Kevin Casas-Zamora, who was vice president of neighboring Costa Rica from 2006-07. “There’s got to be some kind of political deal brokered before the underlying issue is tackled, and the underlying issue is how to make Honduras governable,” Casas-Zamora said. “Because in the end, it was not governable when President Zelaya was in power, and it is not governable now due to the immense international pressure that the new authorities in Honduras find themselves under.” What happens next might depend to some degree on a diplomatic mission to Honduras led by OAS Secretary-General Jose Miguel Insulza. “Now it’s up to Insulza to negotiate this,” said Jennifer McCoy, director of the Carter Center’s Americas Program. “He has leverage from the international community.” Much depends, McCoy said, on whether the new government in Honduras believes it can withstand sanctions until elections are held in November. “Having worldwide condemnation is very difficult for a country,” McCoy told CNN. That condemnation will continue if no settlement is reached, Casas-Zamora said. “My sense is that the international community will keep cranking up the pressure and I really doubt that the new authorities in Honduras will be willing or able to … remain as a pariah state for even seven months until the new government takes over,” Casas-Zamora said on CNN’s “American Morning.” But for a settlement to work, Zelaya has to convince those now in power in Honduras that he is willing to meet them halfway. “The institutions in Guatemala need reassurance as well that Zelaya will respect their authority,” said McCoy. “There’s a lot to do for reconciliation. It’s a deeply divided country.” Zelaya was off to a good start Tuesday with his speech at the United Nations and appearance before the OAS, said Casas-Zamora. “My sense is that President Zelaya made all the right noises yesterday when he spoke at the general assembly of the U.N.” Casas-Zamora said. “And he indeed opened some avenues of dialogue and it remains to be seen whether the new authorities in Honduras are willing to respond in kind.” iReport.com: Are you there Share your photos, videos The OAS comprises 35 nations from North, Central and South America and the Caribbean and, according to its Web site, was formed to cooperate on shared interests and to promote democratic ideals. The Honduran Coup: How Should the U.S. Respond?